SYI Steps are manufactured to our strict quality standards, which meets the requirements of EN 13101. Designed by a group of experienced technical engineers, SYI steps have been a new symbol of quality, safety and reliability in manholes and vaults. Encapsulated with high quality polypropylene, our safety features include bright yellow color for higher visibility, anti-slip raised design, staggered ends for greater holding power, 2 foot blocks and strong corrosion resistance. SYI also manufactures a wide range of manhole steps, including aluminum steps, ductile iron steps with black bitumen coating, ductile iron steps with galvanized coating, cast iron steps and steel steps. 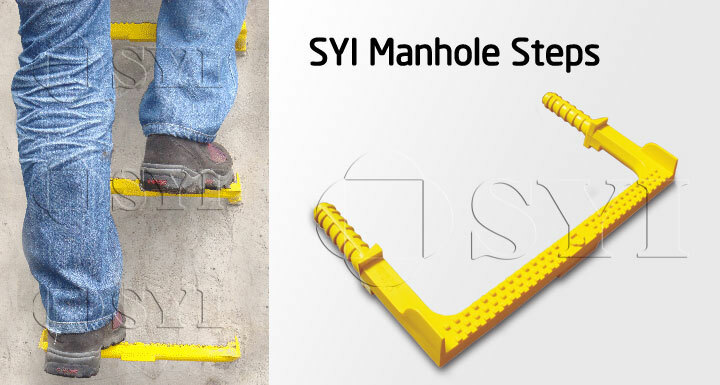 All of our steps can be fitted when manhole is being formed or to an existing structure. SYI is continuing to provide new designs for our customers.